Stop what you're doing and look at this. 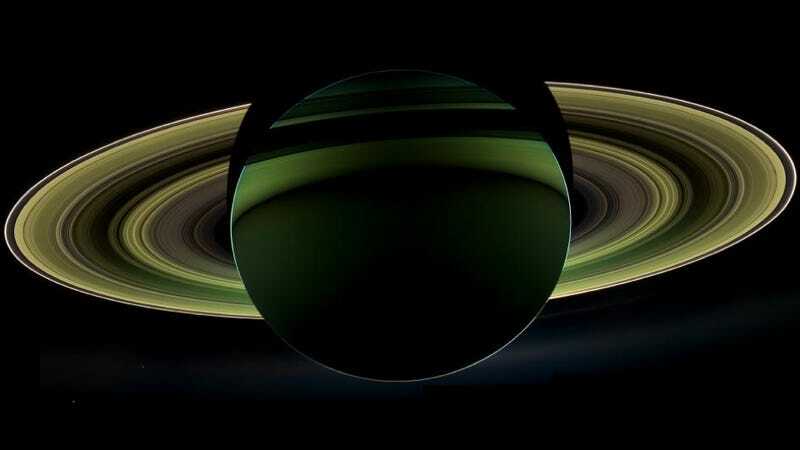 Banded, backlit and beautiful, this verdant view of Saturn — just released by CICLOPS — is one of the most remarkable images of the planet ever captured by NASA's Cassini spacecraft. And trust us, that's saying something. "In that mosaic," the Cassini team notes, "planet Earth put in a special appearance, making 'In Saturn's Shadow' one of the most popular Cassini images to date." As Porco noted in her Captain's Log, Earth is hidden from view in the this, the latest backlit view of the ringed planet; but we suspect the image's unprecedented detail and eerie, otherworldly hues will make it every bit as popular, in the long run, as its predecessor. Read more about the image over at CICLOPS, where you'll also find links to hi-res versions of the image.